Besides booze and glassware, cocktail shakers have become the most important items in my bar. 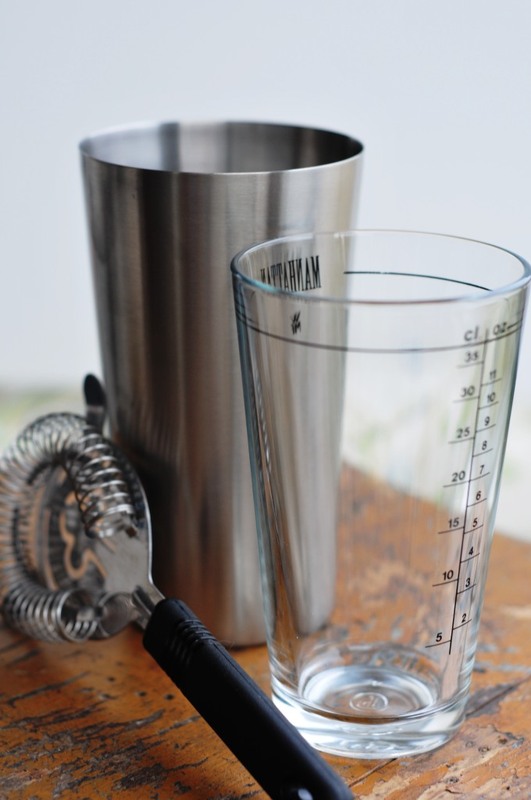 Although a shaker isn’t necessary for well drinks, once you venture into martini-style beverages you’ll likely find a shaker to be indispensible. While some purists eschew the shaker in favor of stirring (“For the love of God, don’t bruise the gin!”), our guests love nothing more than the “happy sound” of their cocktail being briskly shaken. You can’t argue with James Bond. I generally use three different shakers, and I select among them depending on the type of cocktail I’m making and also on the number of people I’m serving. I’ll cover all of that here, but if you’re just beginning to outfit your bar, you can easily make do with a single shaker. If that’s your case, I’d recommend starting with a traditional 3-piece shaker. You’ll find these in every kitchen store and most department stores; they’re usually made of metal and they have a body for the ingredients, a strainer lid that fits over the body, and a cap that you remove to pour the contents through the strainer. Traditional shakers commonly come in two sizes: 20 ounces and 24 ounces. These size measurements can be deceiving, as a 20 oz. shaker will actually only hold about 16 ounces of ice and liquid, and a 24 oz. only holds about 20 ounces. I use both sizes frequently, and sometimes at the same time. If you’re only planning to own one, I’d get a 24 oz. model. This size is perfect to make four servings all at once, which is great when you have 3 or more guests who’d like the same drink. With a smaller shaker, you’ll have to work fast to get that first round into everyone’s hand at once. You always have the option to make a smaller batch in the 24 oz. shaker. I do like my 20 oz. shaker when I’m making cocktails for two mainly because, while I measure the liquor fairly carefully, when it comes to adding the mixer I generally just eyeball it and pour in enough to get within an inch of the top of the shaker. Making a round of two drinks in the taller 24 oz. shaker requires a bit more precision when adding the mixer. When you’re ready to add to your shaker collection, I’d highly recommend tracking down a Boston shaker . This is the third type of shaker in my regular rotation. It’s a two-piece shaker consisting of a large metal body, generally with a capacity of about 24 ounces, and a glass (much like a pint beer glass) that fits upside down into the body. Traditional 3-piece shakers are great for keeping seeds and pulp out of your guests’ drinks, but the Boston shaker excels at cocktails like classic gin and vodka martinis where fruit residue isn’t an issue. My guests who crave a stiff martini like theirs served with a few flecks of crushed ice dotting the surface, and they’re deprived of that nice touch if their beverage gets poured through the tiny holes in the strainer lid of a traditional shaker. A Boston shaker is a little tougher to find, and its use takes a little longer to master, but I’d never be without one in my bar. Good luck and happy bartending!